Does CETA live up to the SDGs? The European Commission has championed the inclusion of sustainable development chapters in its trade agreements, including the EU-Canada deal, CETA (Comprehensive Economic and trade Agreement), as a key part of its trade policy. The UN Sustainable Development Goals (SDGs) represent the base line for these chapters, but it is far from clear that the EU’s trade policy in general, and CETA in particular, lives up to the lofty ambition of the SDGs. In September 2015, the European Union, along with all its Member States adopted the SDGs and committed to domestic action to meet them by 2030, and in November 2016, the Commission set out in its Communication on next steps for a sustainable European future, how to support the implementation of SDG three to “Ensure healthy lives and promote well-being for all at all ages”. In order to effectively implement the SDGs, and to ensure a high level of health protection in all EU policy (TFEU article 168), health issues must be prioritised in sustainable development chapters of trade agreements, and in EU trade policy more broadly. 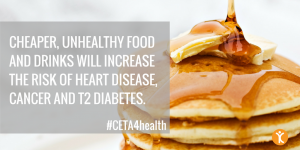 Two key examples in CETA illustrate the pressing need to mainstream health and sustainable development in all EU trade deals: non-communicable diseases (NCDs) and access to medicines. SDG three aims to address the burgeoning global burden of NCDs – cancers, heart disease, strokes, type-2 diabetes and obesity – linked to poor diet, alcohol and tobacco consumption. These chronic NCDs incur a sizeable cost for European healthcare systems, and reduce European citizens’ quality of life – NCDs account for 70 to 80 percent of European healthcare costs, around €700 billion annually. Globally, the World Economic Forum and the Harvard School of Public Health predict that chronic diseases will result in a cumulative loss in economic output of $47 trillion, or 5% of GDP, by 2030. 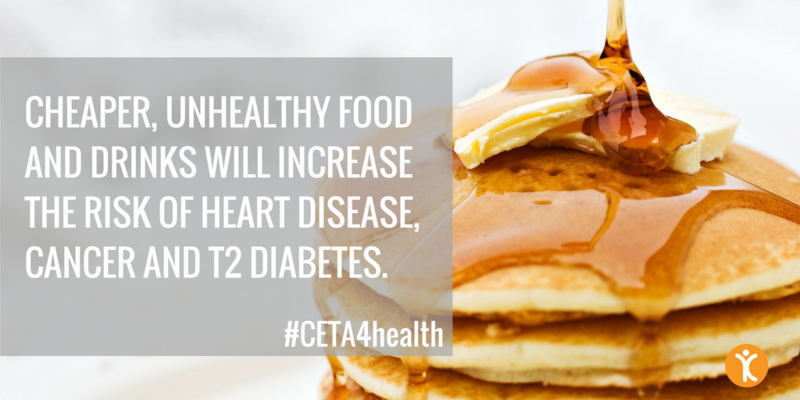 It is in this context that CETA eliminates tariffs on almost all goods, regardless of their impact on health. Under CETA (even under provisional application of CETA) almost all existing tariffs on processed food and beverages (such as soft drinks high in sugar) will be removed. The impacts of this increased affordability have not been studied, but a proliferation of cheaper, unhealthy food products will likely bring negative health impacts, principally through higher consumption of those products. High consumption of food high in fat, salt and sugar (HFSS) is a major risk factor for a range of chronic diseases, as are tobacco and alcohol consumption. As such, in order to be fully coherent with the SDGs, CETA must respect international legal and political commitments relating to NCDs and their risk factors: tobacco , alcohol , food high in fat, salt and sugar (HFSS) , and enable the EU and Canada, or any other EU partner, to advance public health in their trade policy. SDG three also targets the end of infectious disease epidemics (e.g. HIV, viral hepatitis, tuberculosis, malaria and others) and as such the EU must consider these health objectives as part of a truly sustainable trade policy. The failure to achieve the health-related objectives included in the SDGs could fatally undermine the EU’s health security and stability as well as increase pressure on member states health care systems, therefore limiting or preventing the EU’s economic growth. SDG three also increases calls for action on medicine prices – it is crucial to note that high medicine prices are not only relevant for the third world but also for Europe. The fact that intellectual property rights (IPR) are protected in CETA, shows a failure to recognise concerns around the impact of intellectual property rights (IPR) on medicine prices. IPR can act as an insurmountable barrier to equitable access to medicines, by granting monopolies to a given medicine, meaning that other, cheaper, generic versions of the same medicine cannot be placed on the market until the patent protection exists, driving up prices. It is therefore very difficult to change patent processes once they are locked into international trade agreements. As with unhealthy commodities, the impact that CETA or its associated regulatory cooperation would have on medicine prices has not been assessed. 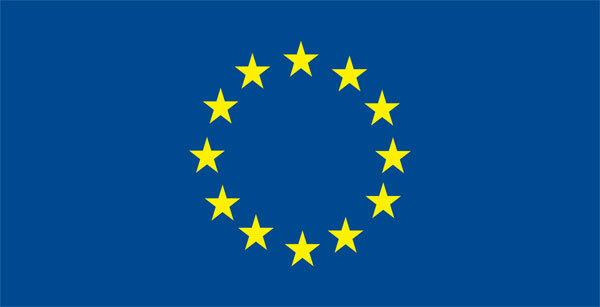 In the light of the above it is crucial that trade and investment policy neither weakens the ability of the EU, its member states or partner countries to take action to ensure the prevention and management of NCDs and infectious diseases, nor impedes efforts to promote universal health coverage and access to affordable medicines. This requires that the EU carry out a health impact assessment for all trade deals, and mainstreams public health concerns and the SDGs in trade deals as cross-cutting responsibilities applying to all chapters of the existing and future Free Trade and Investment Agreements, including CETA. SDG three is especially relevant to promote public health globally, yet all 17 SDGs either directly or indirectly contribute to health protection and improvement: good health is both an outcome of and a precondition for fulfilling the SDGs policy agenda. Therefore, in order to achieve the SDGs, public health security threats must be prioritised in trade negotiations and broader trade and investment policy design. CETA, and EU trade policy, must be brought up to the SDG code. You can read the EPHA’s ‘Unhealthy Side Effects of CETA’ report here. The authors work at the European Public Health Alliance (EPHA). 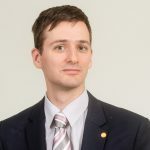 Zoltán is Policy Manager for Health Policy coherence and he is responsible for the effective implementation of the Health in All Policies legal principle in various EU policies. Zoltán leads EPHA’s ‘Trade for Health’ campaign. A Hungarian qualified lawyer with strong commitment to public interest, he has over 12 years of experience including international and European affairs management matters at the Ministry of Health of Hungary, lawyer-linguist experience at the European Court of Justice, and legal practice at national courts. 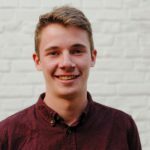 George is Policy Officer for Healthy Trade and Food, Drink and Agriculture) and he helps to advance healthy European food and trade systems. 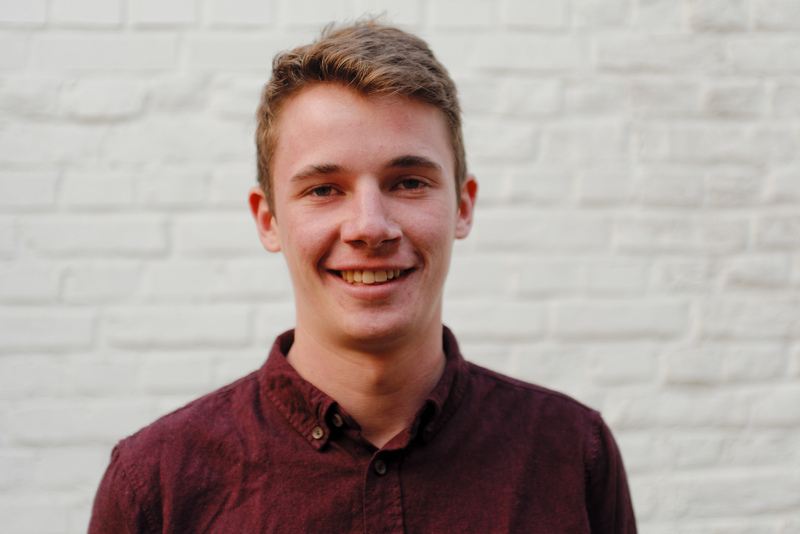 George has experience working to create positive change in European Union policy, having previously campaigned on various issues, including the environment, resource justice and trade. The Transatlantic Consumer Dialogue (TACD) is a forum of US and EU consumer organisations which develops and agrees on joint consumer policy recommendations to the US government and European Union to promote the consumer interest in EU and US policy making.